Description: If he can’t have her . 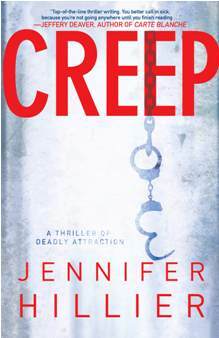 . .
Review: Jennifer Hillier’s Creep is a chilling must-read. Dr. Sheila Tao made a huge mistake when she had an affair with her grad student Ethan Wolfe. Now she is breaking off the affair for her engagement with an investment banker. As the wedding date grows closer, Ethan’s plans development into a horrifying twist that might not only ruin Sheila’s career and engagement but also her life. Creep may be Hillier’s debut novel, but she mastered the art of the thriller. The scenes are so realistic and don’t gloss over any facts. The flawed characters push the plot forward. Everyone has secrets and faults, and Hillier creates wonderful shades of gray. The sprinkling of bread-crumb clues still leave the reader guessing up to the surprising conclusion. The pace is action-packed with never a dull moment. A word of advice though: don’t start this book unless you plan to keep reading until the last page. Creep sticks with you, will follow you around, and just might kidnap your dreams. I loved it! If you are a fan of Chelsea Cain’s Beauty Killer series like I am, then you’ll love Jennifer Hillier’s Creep. I’m on the edge of my seat waiting for book two. Great review! This sounds like an intense book! I bet my mom will get this book now. Great review!